Maximo Dance Studio was founded in 2004 by its current director & principal choreographer Olga Lissovskaia. It is named in honour of one of the greatest Russian ballerinas of all time – Ekaterina MAXIMOva. “Dance is my life”, Ekaterina once said, and so is their. Maximo Dance Studio is a one of kind dance and fitness facility located right in the heart of Woolloongabba, Brisbane. 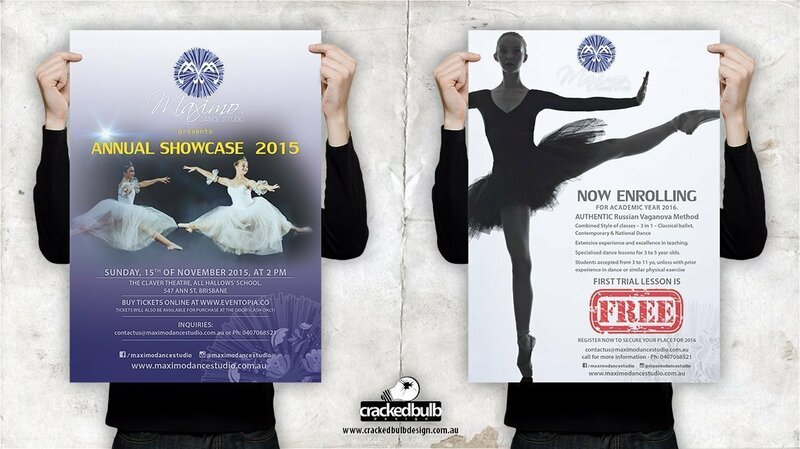 A big thanks to Maximo Dance Studio for giving Cracked Bulb Design the opportunity to design their printed materials.